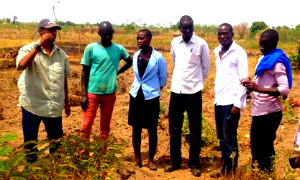 For $51 a month you are helping pay for the tuition of vocational students attending Harvesters’ Vocational Training Center in Yei, South Sudan. The vocational training program exists both for Harvesters’ kids as well as students from the community. It specializes in trade skills such as agriculture, carpentry, and IT all of which are important to the South Sudanese economy. Students who complete the vocational training program will be in a better position to find jobs that help them provide for themselves as well as positively impact their communities.